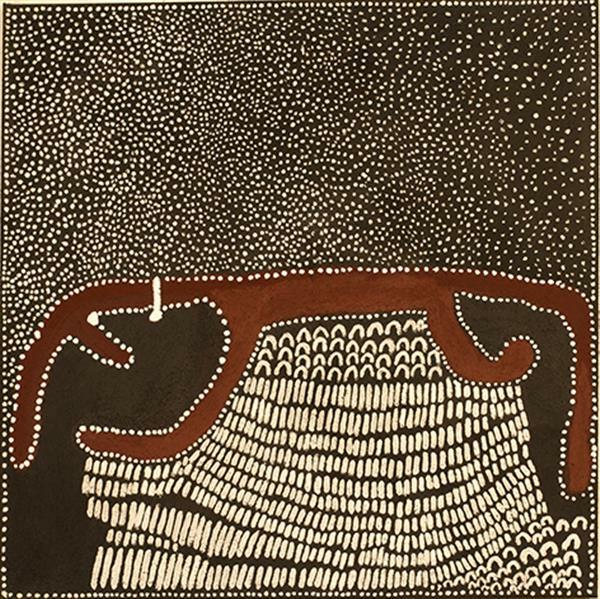 In this new body of work Shirley Purdie draws on traditional Gija stories and Ngarranggarni (Dreaming) passed down to her, as well as her environment surrounding Mabel Downs station in Western Australia. In the Saddle, On the Wall, touring exhibition. Surprising, funny, tragic and complex are just some of the ways to describe an exciting new exhibition of Aboriginal stories about station life and art-making. The exhibition includes paintings depicting station life, alongside 13 digital stories from leading artists in the Kimberley. The films were produced as a collaboration between ABC Open, Kimberley Art Centres and family members of the artists. It is a way of recognising the forgotten Aboriginal history of the pastoral industry. Warmun artists Freddie Timms, Rammey Ramsey, Shirley Purdie, Mabel Juli and Patrick Mung Mung will be exhibited alongside artists including Gordon Barunga, Allan Griffiths and Daisy Andrews. To see the catalogue, click here (6MB). 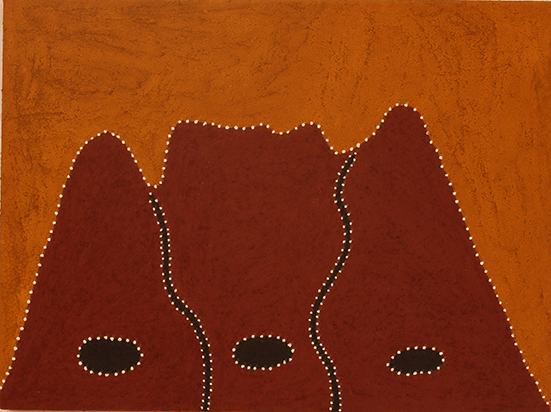 Image: Mabel Juli, 120 x 360, natural ochre and pigment on canvas, 2013. Joonba, Junba, Juju, UTS Sydney. Joonba, junba and juju are three names from Kimberley Aboriginal languages for a specific form of performance driven by narrative. In Gija and Miriwoong languages the word is joonba, in Ngarinyin junba and in Bunuba country juju. Bringing together different countries and language groups from across the Kimberley, Joonba, Junba, Juju is part of a gradually unfolding project that has strengthened these song and dance cycles in the region. This exhibition is one in a series by an alliance of four leading Aboriginal-owned art centres in the Kimberley working together as Kimberley Aboriginal Artists (KAA). Mangkaja Arts Resource Agency, Mowanjum Arts and Culture Centre, Waringarri Aboriginal Arts and Warmun Art Centre present: Joonba, Junba, Juju – an exhibition focused on the power of material objects made and used for these song and dance cycles, complemented by digital media presentations of these performances.